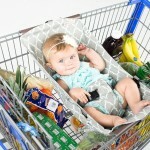 Home » Shopping with a Baby » When can you put your baby in a shopping cart seat? When I was a new mother, one of my first outings was to the grocery store. My family had to eat and eventually, I couldn’t avoid it any longer. I watched the other moms in the store with older children sitting in the seat portion of the cart and wondered when I could put my child in that seat. The answer may be different for each child, but tiny babies certainly can’t sit in the cart seat. So what is a mom to do? Many moms put the car seat directly into the seat part of the cart. While it’s done often, it’s not really safe. The car seats don’t latch on properly and can easily tip over. I didn’t want to do anything dangerous so I looked into other options. As your child starts to grow then the way you transport them will change. At first its fun to carry your new baby in his car seat. Its simple and quick to plug into the car, and transfer into the home or store. As baby grows carrying that car seat can become a challenge, if you are still carrying it after six months you are doing well! Plus your baby will be wanting to sit up and explore his surroundings, being confined to a car seat is no fun! If your baby is not happy in his seat he will soon let you know? Besides, now he will probably be able to sit up unsupported. As soon as he can do this then you are ready to start using the seats in the carts. You do need to be careful, your baby is still very small now, and the cart seats can be quite big! So long as you are able to support your child safely in the seat then you are fine. To start with we ‘packed’ our baby in with extra jumpers or a small travel blanket. This was not very convenient, which is why we started to look round for other options. I started seeing shopping cart covers and thought it was a wonderful, novel idea. The more I looked into it, the more I realized there were options out there. These options work for many different age ranges. Moms can get things for babies, infants, toddlers and beyond. If your baby is growing fast, but still unable to sit up by himself then there are still some great options to consider. We really like the baby hammocks you can buy. They are safe and comfortable for the shopping cart, and they can also be used as an impromptu bed if you are out and about! 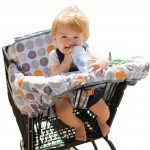 Here are a few of the best cart cover options to consider based on the age of your baby. If you have a baby who can’t sit up yet, this hammock is the perfect solution. You can place the baby in the cart safely and even save room over having a huge car seat in the way. The baby will be confined and safe, but she can also see out better, which will keep her happier. This is a great option for the first several months with a new baby. 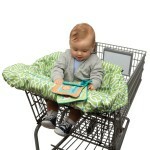 This shopping cart seat is perfect for babies in the next stage of life when they are learning how to sit. The bench is small and keeps babies from toppling over. It will work for many months, even once the baby knows how to sit properly. It also keeps babies away from the germ-riddled handle of the cart. When baby is a little more active, this is a great cover option. It has tethers for toys and a place to set a drink and snack. The back of the cover is padded so the baby will be comfortable even during longer trips. And the entire metal portion of the cart around the child is covered so there are no germ worries. 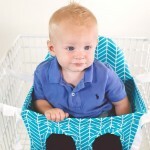 This simple cart cover is perfect for children who sit well and it is easy to wash between uses. The soft material is bright and attractive to toddlers who have short attention spans. It keeps them away from the germs and is simple to put on and take off with one hand. Once the baby can sit well, this option is great. 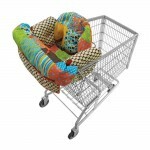 It has elastic around the ends so it will snap onto any cart and sit in a secure manner. The soft fabric can be wiped clean, or run through the washing machine. Verdict: Its easy to keep your young baby safe in the Shopping Cart! There are a lot of options on the market and you can make your decision based on how old your baby is and what you need. It’s nice to get something that will last for as long as possible, especially if you plan to have more children in the future. My shopping cart cover survived two children and I loved every use. Using the cart seat is not only handy, but also a necessity. Everyone has to visit the store, but it doesn’t have to be a painful, worrisome experience.